Foot-stamping in rabbits indicates that something in their environment is bothering them or causing fear. There are exceptions, however. Rabbits in captivity and in nature regularly stamp their feet for various reasons, including warning other rabbits of approaching danger, showing apprehension and attention-seeking. If you hear your rabbit stamping his back legs onto the ground, it often means that he suspects an approaching hazard. Foot stamping is a common defensive behavior that rabbits, as prey animals, use in the wild. It generally means that they hear or see a predator off in the distance. Perhaps your rabbit heard a loud sound that jarred and scared him. When rabbits stamp their legs, it usually signifies that they sense looming danger and they're trying to notify the other members of their social circle, often other bunnies that live in their residence. Rabbits stamp both with single hind legs and two hind legs. Stamping with single hind legs is a common indication of "warning" mode. Foot stamping in rabbits may indicate something that isn't directly related to fear, but rather -- irritation. If you unintentionally did something to irk your bunny, he might respond by thumping one or both of his back feet. Perhaps you held your bunny -- much to his protest -- and placed him back on the ground. By stamping his feet, he's communicating his irritation or discomfort. Be cautious, as some rabbits thump their feet as precursors to biting -- a form of dominance behavior. 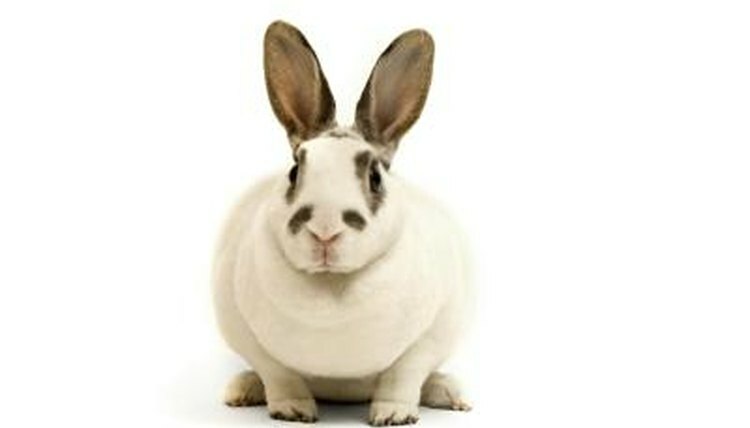 If this becomes a problem, neutering or spaying often minimizes dominance behavior in mature rabbits. Don't assume your sweet, unassuming rabbit never gets angry. Rabbits often display rage by stamping their feet. If a rabbit spots another bunny encroaching on his turf, he might react by stamping his feet -- his way of saying "back off," trying to establish dominance. Infuriated rabbits sometimes combine foot stamping with vocalizations similar to grunting. Rabbits often hide physical discomfort as a means of masking vulnerability and feebleness to nearby predators. When they're hurting, they're often immobile. Rabbits can display pain, however, with conspicuous foot stamping. The stamping might also be accompanied by other indications of discomfort, including fierce behavior, snarling, shrieking and occasionally biting. If you think that pain is causing foot stamping and other behaviors in your pet, bring your rabbit to a veterinarian immediately. If your rabbit thumps his feet, it could mean he wants you to look at him. Perhaps the little guy is lonely and wants you to play with him or stroke him for a little while. He might even be requesting some yummy treats from you. What Does Chin Rubbing Mean for a Rabbit?